The Waldorf Astoria is a fabulous 5 star hotel where guests can reside in one of the most luxurious resorts in the Middle East. The incredible facility is located in prime beach front position offering guests the chance to relax in the beauty of the Arabian sea on the hotel’s 400 yards of private beach. The resort is perfectly designed to cater to everyone’s holiday needs, whether you wish to spend your days soaking up the spectacular sunshine by the pool or try your hand at some watersports, there is something for all the family at the Waldorf Astoria Ras Al Khaimah. It is not just a stunning stretch of beach that the hotel is famed for, the resort is also the perfect place for any golfers in the area. 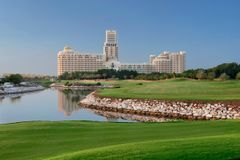 With 2 world class 18 hole courses within 20 minutes of the hotel, guests are spoilt for choice of incredible places to play when staying at the Waldorf Astoria. The resort is a truly fantastic holiday destination where the entire family can relax and enjoy the beautiful scenery that surrounds them from the comfort of 5 star accommodation. The beautiful hotel is just 50 minutes from Dubai International Airport which is the number 1 airport for international passengers according to the ACI meaning that getting to this beautiful destination is never a problem. The accommodation at The Waldorf Astoria is the perfect place to rest up after a busy day of basking in the glorious sunshine. The hotel is comprised of 346 lavishly designed guest rooms all of which come with unrivaled views of the Golf Course or the serene Arabian Sea. There is a vast array of rooms with range from 50 square meters to 170 square meters which are the gorgeous suites fit for royalty. Regardless of the room you have, each is fitted with a number of different amenities such as TV, air-con, shower, bath, minibar and WiFi all of which are in place to ensure that your stay is a cut above the rest. The rooms and facilities at the resort already to such a high standard it is no surprise that the dining options are such fine dining. There are 9 restaurants in total on site, each of which offer guests the chance to sample exquisite cuisine from all over the world. Included in this is an award winning steak-house which is one of the best restaurants in Dubai, a Japanese and an incredible Middle Eastern restaurant which provides guests with a wonderful dining experience as well as amazing food. On top of a brilliant golf course, 9 stunning restaurants and 400 yards of private beach - the resort also boasts a fantastic health club where guests can receive personal training. Furthermore, the spa is the ideal relaxation spot and offers an array of unique treatments designed to induce relaxation. As previously mentioned, The Waldorf Astoria is a wonderful place for the whole family to enjoy a dream vacation. The kids club offers children the chance to engage in a wide variety of different activities from the beach to treasure hunts and allow parents to go and explore Dubai, enjoy a spa day or play 18 holes of truly beautiful golf.